Get your 2.5" x 2.5" ZCash Cryptocurrency Sticker and show your support for genuinely anonymous cryptocurrency technology. ZCash was the first truly anonymous cryptocurrency based on the addition of the ZeroCoin protocol to Bitcoin. The ZeroCoin protocol was a long term research endeavor to develop a truly private and anonymous protocol to protect Bitcoin users and make payments anonymous. ZeroCoin is based on zero knowledge proofs which simply put is a neat mathematical way of proving something happened without anybody knowing the details thus eliminating the ability of parties to trace transactions. While Bitcoin hasn't adopted the ZeroCoin protocol the ZCash and ZenCash cryptocurrencies have. 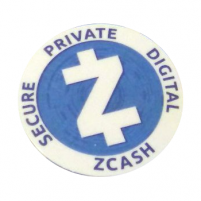 Time will tell if ZCash or ZenCash take off- but in the mean time let others know you support ZeroCoin cryptocurrencies with this ZCash Cryptocurrency Sticker.